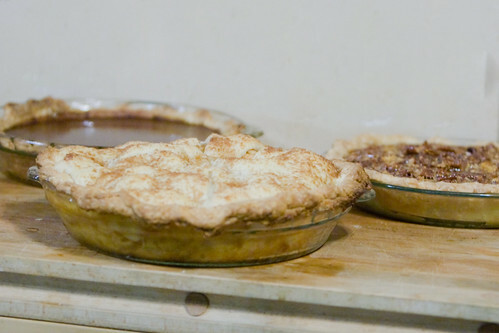 Thanksgiving Pies, originally uploaded by Lindsay Beyerstein. The pie in front is mixed apple with 2tbs apple cider vinegar substituted for the lemon juice--a great combination, adds tartness with more depth of flavor than lemon. On the back left is Dorie Greenspan's burnt sugar pumpkin pie--a sophisticated alternative to plain pumpkin with a shiny surface and a deep, slightly bitter caramel flavor. On the back right is the Cook's Illustrated pecan pie, which I'm going to make again for Christmas with a little less sugar. This year, there were 20 hungry cephalopods including 3 screaming young octopod fries, assorted bivalves and oysters, and, worst of all, an elderly 95 year old who watched football games day long with the TV volume on screech because the elder triton was hard of hearing. Next year, Lindsay, you are invited to my place. As Uncle Soupy used to say, "let them eat pie!" You're clearly not from the South, as the words "let sugar" and "pecan pie" have never been used together by a southerner. What does "mixed apple" mean? I used a mixture of different varieties of apple (2 Golden Delicious, 2 Cortland, 2 Macintosh, and a Granny Smith).